Rebirthing-Breathwork, also called "Conscious Breathing", is a branch of alternative medicine which postulates that specialized breathing techniques may have theraputic benefits. In Rebirthing-Breathwork, the client makes a connected breath without a pause between inhale and exhale or between the exhale and inhale. According to practitioners, this causes a build up of prana or life energy. A state of deep peace and relaxation is achieved fairly easily by most. Breathing sessions are done lying down and usually last one to two hours. It grew from the work of Leonard Orr. It was so named because when he first started doing this kind of work he noticed that he would often have what he describes as memories of his birth. Orr developed his process between 1962 and 1974 as he (without any (then) awareness of yoga or breathwork disciplines) discovered that modifications to breathing practices could bring about improvements in health, mental clarity and emotional well-being. 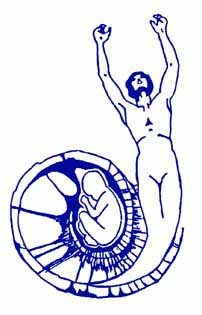 Development of Rebirthing as a therapeutic modality in its own right peaked in 1974, and has been extended from that point since. Orr, accompanied by fellow researchers, refined it into a system that can be practised in the context of a professional therapy session and taught to clients over a series of sessions, ten being the recommended minimum. Proponents estimate that, since 1974, more than ten million people worldwide have learned the process, with more than one hundred thousand people completing practitioner training. Orr's work was influential in the development of the more general topic of Rebirthing. In contrast to the narrow definition of Orr's "Rebirthing-Breathwork", the term "rebirthing", is now often used to refer to any therapy that postulates that human birth is a traumatic event. Therapies associated with the more general "rebirthing" can include breathing sessions such as are discussed here, but also often including "add-ons" other than breathwork in a session. No such "add-ons" are taught in the narrower treatment of "rebirthing-breathwork" sessions. The philosophies which accompany Rebirthing appear to be a loose, intuitive mix of western metaphysics, gnosticism, hinduism, buddhism, and (what some may argue to be) original Christian teaching. Humans never forget their birth - they just suppress the memory. Proponents posit that humans often access memories from prior lives as well as from the Collective consciousness through this process. In addition to cerebral memory (based in the brain), humans also possess 'cellular memory', which is distributed amongst the body's cells, tissues, organs etc. The trauma suffered during birth, and the specific nature of this trauma, has a deep effect on one's psyche and shapes one's perception and experience of life, self and the world in ways which one is mostly unaware of. This is referred to as Birth Trauma, one of the 5 major trauma's that Leonard Orr describes as contributing to negative experiences in this lifetime. The other four are: Unconscious Death Urge, Past Lives, Specific Negative Experiences (in this lifetime), and Parental Disapproval Syndrome. All of these can be cleared through Conscious Breathing, although birth issues tend to surface first. It is possible to gain recall of aspects of birth (also gestation and early childhood) and to release the accompanying emotions; such release usually becomes a decisive, influential and positive 'paradigm shift', often referred to as a 'breakthrough'. Human breathing is almost universally inadequate; virtually all people are suppressing large amounts of emotional, physical and mental "tensions" and require relatively high levels of CO2 in their blood to keep these tensions suppressed. The major causes of all human illness are these accumulated tensions; release of such tensions can cause physiological transformation to the point where permanent spontaneous remission from such illness becomes possible or highly probable. Conscious breathing releases physical toxins that are stored at a cellular level. Can lead to physical immortality. Many rebirthers are immortalists.